Hereafter tells the story of three people who are touched by death in different ways. George (Matt Damon) is a blue-collar American who has a special connection to the afterlife. On the other side of the world, Marie (Cecile De France), a French journalist, has a near-death experience that shakes her reality. And when Marcus, a London schoolboy, loses the person closest to him, he desperately needs answers. Each on a path in search of the truth, their lives will intersect, forever changed by what they believe might--or must--exist in the hereafter. Download Hereafter in Digital HD from the iTunes store. 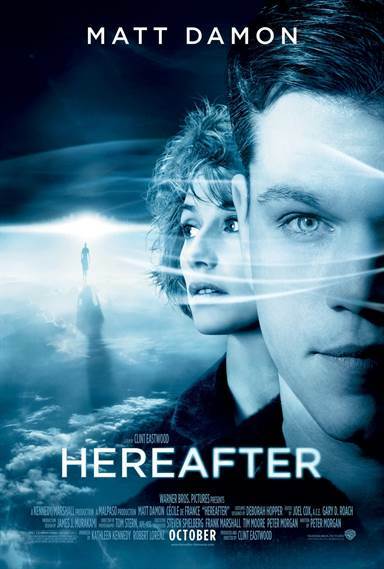 Hereafter images are © Warner Bros.. All Rights Reserved. Hereafter, is the latest dramatic effort from Clint Eastwood, written by Peter Morgan. The film revolves around three parallel stories. They are about three people affected by death in different ways; Matt Damon plays an American factory worker named George, who has a gift that enables him to communicate with the dead. Cécile de France plays a French television journalist named Marie, who has miraculously survived a tsunami, and Marcus and Jason are played by Frankie and George McLaren. They are English brothers, and one is killed in a car accident. As the film develops, all three stories and characters eventually converge. Bryce Dallas Howard, Lyndsey Marshal, Jay Mohr and Thierry Neuvic all star in supporting roles. Death and the afterlife is a very hard subject matter to tackle since so many people have different views on it, and it is extremely hard not to bring religion into the mix. However, Clint Eastwood skillfully navigates this hot taboo subject with ease and does not offend anyone in the mix. The film interweaves the three stories together, allowing the audience to experience their lives in as they unfold in the world of the film. Clint Eastwood's storytelling and directing skills are at the top of his games as he creates wonderful scenery and outplay of dialog on the screen throughout the entire film. The actors in the film are top notch…Matt Damon is on top of his game as usual, and actress Cécile de France and Frankie and George McLaren's performances are unbelievable. It is great to see some fresh blood in a basically Hollywood production. In the end, the story does take the road more traveled to tidy up the ending. However, Clint Eastwood certainly has Oscar material on his hands. If you are in the mood for a great drama this weekend, I would highly recommend seeing this film. Hereafter images © Warner Bros.. All Rights Reserved.